INTRODUCING THE VANCOUVER PARKS WINTER GOLF CARD! 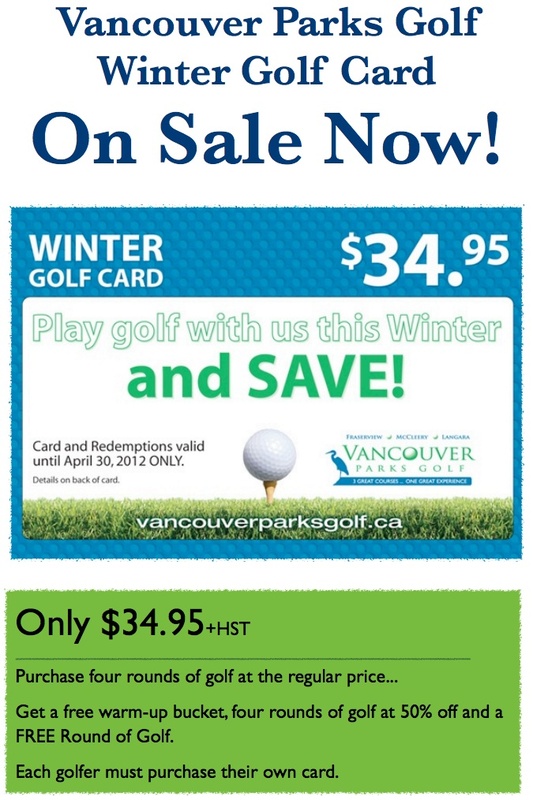 Beginning November 1st, 2011 Vancouver Parks Golf will be offering a winter golf savings program to its loyal customers. The VPG Winter Golf Card will be available for purchase in all three of our golf shops and provides the opportunity for loyal golfers to save on winter golf. The cost of the card is $34.95 and all cards and redemptions are valid until April 30th, 2012. The card is simple to use. Play four regularly priced games of golf then receive a free warm-up bucket at Fraserview or McCleery driving ranges at the time of your fifth game. Golf games five, six, seven, and eight are played at 50% off the applicable rate and game number nine is FREE. It’s that simple.